A Letter of Recommendation To Whom it May Concern I am recommending U.S. Immigration Legal Advisors without reservation to any person seeking to obtain a K-1 Fiancee Visa granted by the USA government for their future partner in marriage. But first a little background information. I am a Director of manufacturing for a emerging high technology company based in Seattle, WA. My work demands a great deal of my time and energies. I have frequent interruptions to my normal routine because of unpredictable travel on company business. On a bussines trip to Asia in early 2007 I met a wonderful Thai lady, during the course of the next 7 months we fell in love and decided to marry. We were very concerned about the selection of a competent agency to retain for the task. Luckily, I found the U.S. Immigration Legal Advisors internet site and retained the organization to guide us. Following are my reasons for recommending this organization to anyone. 1.Accuracy: the internet site describes the immigration process for a fiancee as my friends has informed me but in much more detail. The information at U.S. Immigration Legal Advisors internet site is accurate and complete in every way. 2.Organization : The U.S. Immigration Legal Advisors organization is based in Thailand a few blocks from the USA embassy, [ I liked the fact that there was a photo of his organization ]. This was a good feature I wanted in a representative. A USA office on the east coast handled any state side matters. I felt that the organization was small enough to provide personal and efficient service. 3.Personnel Care: They provided personal and hands on management of my VISA approval process at each step. All questions which came up on my part were answered within 24 hrs by one of the staff. They gave us special instructions to ensure that the USA embassy in Thailand was convinced we had a meaningful relationship, a key factor at the Thai side interview. As the time approached for the interview of my fiancee at the USA Consular, she became very nervous. I told them and they arranged for not 1 but two practice interviews with my fiancee in Bangkok prior to the interview. After the second practice interview, she wrote me, and said “I can do it now”. 4.Care of Detail: There were unforeseen issues that surfaced and were resolved in a seamless manor. Thai documents for my fiancee’s changed name, birth certificate, custody release for a former husband had to be obtained, and translated to English. 5.Efficiency: We filed on Feb27th 2008 the request of a K-1 VISA on Immigration Form 129F at the CA,USA process center. All paperwork was accurate at filing, there were no delays at any step. 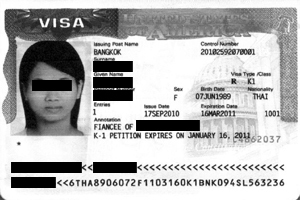 Her K-1 and her daughters K-2 VISA were granted at the US Embassy in Thailand interview Sept. 17, 2008 I brought my fiancee to the USA on October 7, 2008. 6.Results: What more can I say, nothing speaks better than the great results achieved by U.S. Immigration Legal Advisors! "I can’t thank you enough for all the help you gave Olive and me in getting her visa"